Earlier this year, Venezuelans suffered through acute food shortages. Now food is starting to reappear on more and more supermarket shelves. But the prices are prohibitive for almost everyone. "The prices are really really high...people are just shocked by the price increases," says Alejandro, a 24-year old who works at a law firm in Maracaibo, Venezuela, near the border of Colombia. It's the latest reality in a country where people are going hungry: food within eyesight but out of reach. 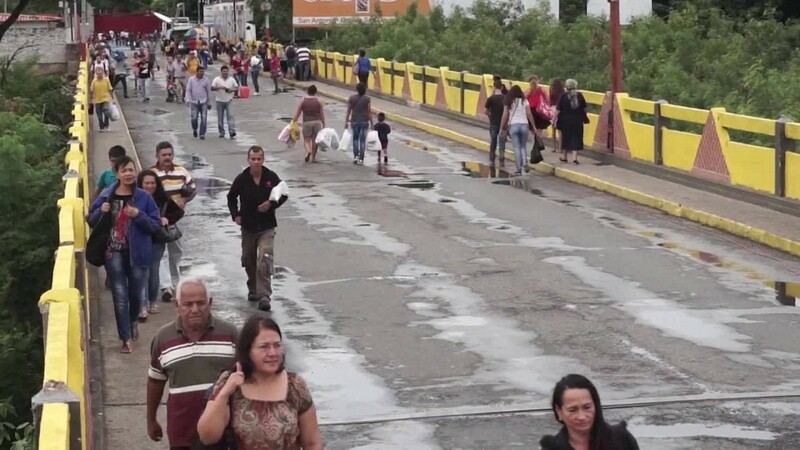 To ease the shortages, Venezuela's government has quietly stopped enforcing some of its price controls on food in parts of Venezuela that border Colombia and Brazil where food is shipped in. It wasn't feasible for many Venezuelan businesses to bring in basic goods from other countries. That's because no matter what price they paid, they were forced to sell at super low prices dictated for years by the socialist government. But now food importers can bring in basics like eggs, milk and flour -- things that have been previously scarce on shelves -- and sell them without price controls. It's the reason supermarkets have more food now than in previous months. However, the difference between Venezuela's price controls and market prices is significant. Venezuelans say they've seen staggering price hikes as the country struggles with exponentially rising inflation. The IMF forecasts inflation in Venezuela to rise 475% this year. For example, Venezuela's most popular dish is the arepa. Call it the hot dog of Venezuela. It's made with cornmeal. 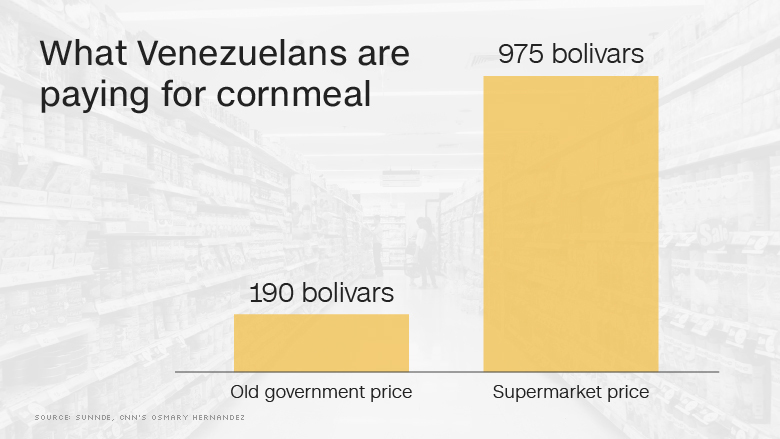 The government's price for cornmeal was 190 bolivars -- or about 16 cents -- for a two pound bag. In supermarkets today though, cornmeal made in Venezuela is selling for 975 bolivars, and imported cornmeal goes for 1,850 bolivars. And even that sometimes isn't always available, Venezuelans say. That's when the black market kicks in, where unofficial food vendors sell the bag of cornmeal for as much as 3,500 bolivars -- or $3. "The price of everything skyrocketed," says Simon, a 25-year old recent college graduate who teaches high school students in Caracas, the country's capital. "There's no quality of life here." Simon makes roughly 96,000 bolivars a month on the ever-rising exchange rate. That's equal to about $80. He hasn't had meat in his fridge in a month. "Not because we can't find meat, but because it's very expensive," says Simon. He lives with his mother, Carmen, in an upper middle class neighborhood. The price for a dozen eggs in some supermarkets in Caracas is now 1,800 bolivars ($1.50). A year ago it was 500 bolivars ($0.40). The government's price on a liter of milk is about 350 bolivars, but it's being sold now for 970 bolivars in some stores. The shortages have even hit middle class Venezuelans hard. Simon and Carmen went without toilet paper for a month in July, and during various times this year they've been without milk, eggs and cheese. Last month, Carmen flew to New York to visit her daughter and took back basics, like toilet paper, to Caracas. Simon and Alejandro, who don't know each other, stress they are the lucky Venezuelans who can get by despite being without some basics. For the poorest Venezuelans, the current minimum wage, including the equivalent of food stamps, is 65,000 bolivars a month (roughly $54). That means one bag of cornmeal and a dozen eggs could take up as much as 8% of a worker's monthly pay. What's unclear to many Venezuelans is whether the government will continue to turn a blind eye and not enforce its price controls -- or if it will start reenforcing the controls because people are complaining about sky high prices. That uncertainty frustrates many Venezuelans. At this point there are no good options for the government or its people. "What's worse -- for there to be empty shelves, or stocked shelves with prices that are exorbitantly high?" says Daniel Osorio, who spends a week every month in Caracas and leads the investing firm Andean Capital Management. "When it was at the old price, there was nothing available."